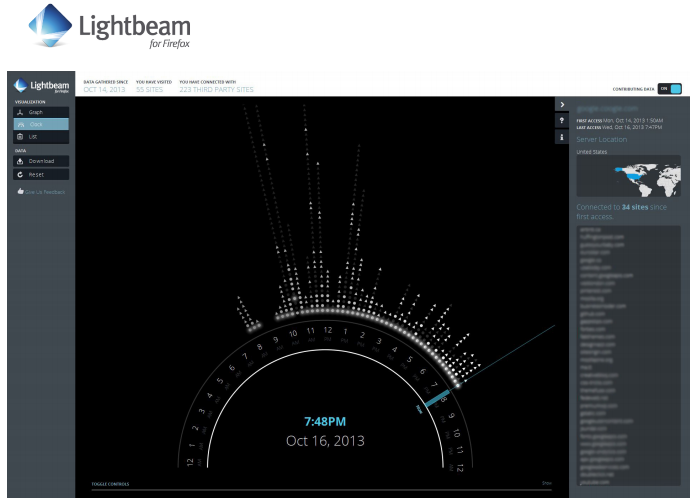 Mozilla, makers of the Firefox browser, has released an add-on called Lightbeam for Firefox which presents a visualization of your browsing history and analyzes which applications are tracking or monitoring you online and how they are connected. The company had previously released an experimental add-on for Firefox called Collusion in a bid to better understand how first-party website tools shape a visitor’s experience and how their data is tracked. Following on from its work with Collusion, this second phase of the project now aims to allow users to see exactly who is getting access to their data, and how, with a view to changing Web behaviour of individuals and businesses alike. Lofty, and worthwhile, ambitions. With a new name and new features, Lightbeam will now show how third-party tools – whether that’s social sharing options, advertising, personalization features or anything else – as well as first-party ones, track and share data as you move around the Web. To use it, simply install the plugin and it will start analyzing the websites you visit to provide you with a graphical representation of the tools being used on those sites. From there, you then have the option to share your data with the Lightbeam database in order to contribute to the wider picture of how different elements, some of which are likely to be a little opaque, of the Web are connected. Mozilla says it’s still early days, though, and that it will continue to refine Lightbeam. All of the code for Lightbeam for Firefox is also available on Github for you to “hack, expand and improve”.